House Speaker Paul Ryan of Wis., center, on Capitol Hill in Washington. 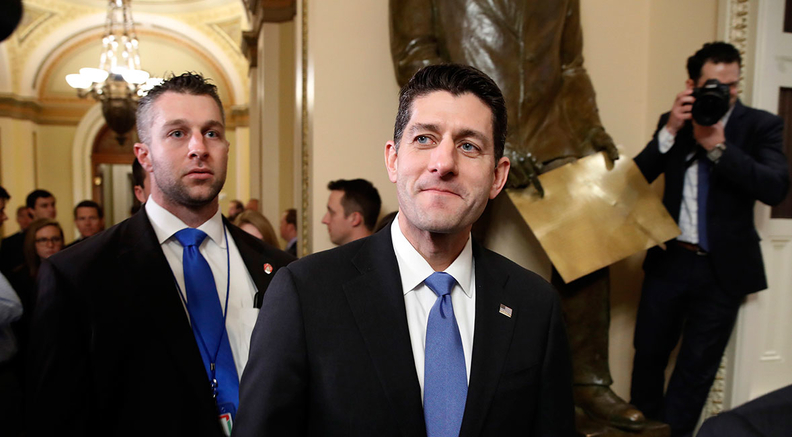 After a five-hour shutdown, Congress early Friday passed a massive budget deal that will have a significant impact across virtually every sector of the healthcare industry. Sen. Rand Paul (R-Ky.) forced lawmakers to miss a midnight deadline to keep the government's light on, criticizing his colleagues for adding to the nation's ballooning deficit. "I can't in all good honesty, in all good faith, just look the other way because my party is now complicit in the deficits," Paul said during his filibuster. Eventually, a bipartisan coalition of senators came together to pass the bill on a 71-28 vote. The House, in a 240-186 vote, approved the bill at 5:30 a.m. ET. President Donald Trump signed the continuing resolution a couple of hours later. Although the bill outlines budget goals for the next two years, lawmakers will face another deadline of March 23 to approve detailed agency appropriations. The budget deal, applauded by healthcare stakeholders, is the most significant healthcare legislation written since the 21st Century Cures Act even though it came largely as a surprise and was written behind closed doors in the Senate. It includes a wide array of healthcare measures, including four additional years of Children's Health Insurance Program funding, $6 billion for the opioid epidemic, two years of funding for community health centers, and disaster aid funding with two years of full federal reimbursement for Puerto Rico's Medicaid program. It includes the Chronic Care Act from the Senate Finance Committee, which will let Medicare Advantage plans tailor their coverage for patients and expand telehealth services, among other things. The package also includes a provision that hastens the closure of the Medicare coverage gap for Part D drug costs for seniors—the so-called donut hole—as well as a measure to slow the rollout of the Merit-based Incentive Payment System, which makes providers accountable for saving Medicare money. The donut hole provision lowers beneficiaries' co-pays, while drug companies' discounts will be higher. It repeals the Affordable Care Act's Independent Payment Advisory Board, a panel charged with finding savings for Medicare. So far the panel hasn't been triggered, but the Congressional Budget Office projected that doing away with IPAB could increase Medicare spending by $17.5 billion. While the Chronic Care Act, funding for community health centers and Medicare extenders passed in the House continuing budget resolution earlier this week, the majority of the health package was worked out privately in the Senate and came as a surprise to House lawmakers. For example, the Medicare donut hole provision—which comes at a cost to pharmaceutical companies—was unexpected even by House Energy and Commerce Chair Greg Walden (R-Ore.), who told reporters Thursday lawmakers may take another look at it later. "I support the overall package. I'd have written it differently, because I think there are some public policy issues that we'll probably have to address later on because they could have an effect of actually raising list prices," Walden said Thursday, before the shutdown. "We would have to study the impact, but this was something that to my understanding came in from the Senate side, so we were not, how shall I say it diplomatically, consulted much. I was aware of it at the end." For Paul, the problem came down to the deal's expansion of the deficit. The bill would raise government spending to unprecedented levels and add an estimated $320 billion to the deficit in 10 years, according to the Committee for a Responsible Federal Budget. House conservatives, mainly the House Freedom Caucus and Republican Study Committee, agreed with Paul. The White House issued a statement that included a rundown of its support for the healthcare measures. "The Administration supports other components of the Bipartisan Budget Act, including greater certainty for the Children's Health Insurance Program, an extension of funding for Community Health Centers, and repeal of Obamacare's Independent Payment Advisory Board (IPAB)," the statement, obtained by Modern Healthcare, said. "The IPAB authority allows an unelected, unaccountable board to undertake major changes to the Medicare program. The repeal of IPAB furthers the President's goal of repealing and replacing Obamacare."